Brewer Description: (from bottle) Persistence is a sour red ale aged in our foeder. 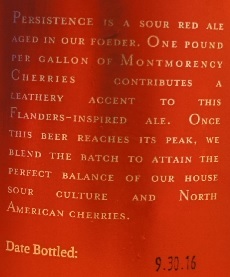 One pound per gallon of Montmorency Cherries contributes a leathery accent to this Flanders-inspired ale. Once this beer reaches it’s peak, we blend the batch to attain the perfect balance of our house sour culture and North American cherries. Intro: A 500ml bottle of batch # 1122, bottled on 30th September 2016. Poured into a 3 Fonteinen stemmed glass. Appearance: A murky brownish red colour with a one and a half finger off white head that dissipated fairly quickly and left only sparse to no lacing. Aroma: Tart, cherries, mixed berries, light leather with a strange but interesting hit of cinnamon. Taste: Very similar to the aroma, tart, sour, cherry, some mixed berries, oak, leather and cinnamon.